Hyacinth Yennie, of Hartford, shows her support for Rep. Chris Murphy during the Democratic State Convention at Central Connecticut State University's Kaiser Hall in New Britain Saturday, May 12, 2012. NEW BRITAIN -- U.S. Rep. Chris Murphy easily shifted Saturday from being the Democrats' presumptive nominee for U.S. Senate to the endorsed candidate, winning the party convention's nod with 76 percent of delegate support after one round of voting. 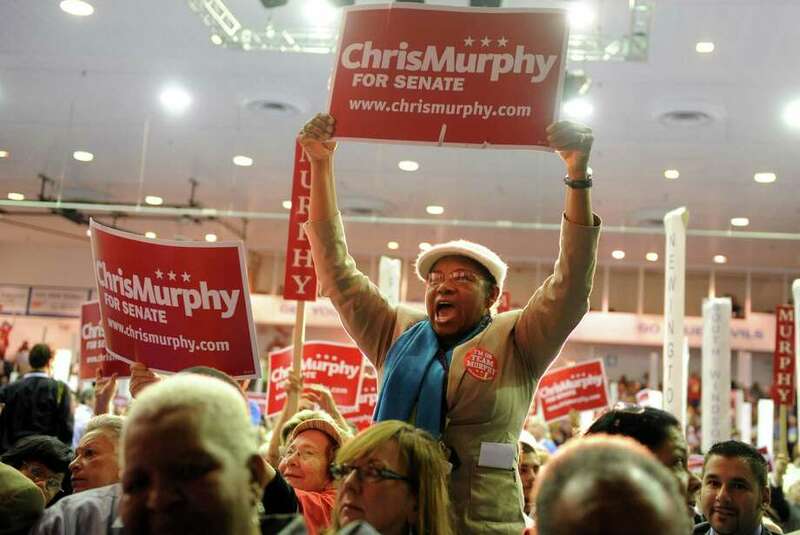 "This was a resounding margin: a 3-to-1 message at this convention," Murphy, 38, said in his victory speech at Central Connecticut State University's Kaiser Hall. "From every corner of the state, cities and suburbs, small towns, I am proud to be your endorsed candidate today." He did not mention her by name, but the statement was squarely aimed at ex-Secretary of the State Susan Bysiewicz, who garnered 24 percent of the delegates' votes, enough to qualify for an August primary. Murphy, who is not as well known beyond the 5th Congressional District, where he first served as a state legislator, crowed a bit more afterward to reporters. "Susan Bysiewicz has worked these delegates for 20 years," he said. Now begins what Murphy called a two-front war against his fellow Democrat and the Republicans. The two major contenders for the GOP nomination are Linda McMahon, whose family owns Stamford-based World Wrestling Entertainment, and former U.S. Rep. Christopher Shays. They are likely to compete in their own primary contest. A Quinnipiac University poll in March had Murphy besting McMahon, 49 to 39 percent, but in a virtual tie with Shays, 41 to 40 percent. McMahon is the favorite to secure the GOP nomination and win the primary. Murphy reiterated he would prefer the Democrats unite to focus on the Republicans but said the party has emerged unscathed before and gone on to win the general election. He joked this is his first primary because he has had the fortune -- or misfortune -- of seeking seats no one else wanted. In 2006 he left the General Assembly to challenge what most observers at the time felt was a secure Republican seat held by Nancy Johnson. "People told me I could never ever beat Nancy Johnson," Murphy said during Saturday's speech. "We went out and we didn't just beat her, we creamed her by 13 points." McMahon's campaign issued a statement congratulating Murphy then quickly condemning both him and Shays. "Linda McMahon presents a stark contrast that will lead to victory in the Republican Convention next week, the primary in August and the general election in November. Linda is a job creator and she has a detailed plan to get people back to work, cut middle-class taxes and turn our economy around," said her campaign's statement. First-term U.S. Sen. Richard Blumenthal beat back McMahon's self-funded, $50 million campaign in 2010, but he had to work harder than initially anticipated. He also served as attorney general when Bysiewicz was secretary of the state. "We will be united, no question about it, whether it's the end of today or end of the primary," Blumenthal said, adding a primary could be good for the party if the GOP is engaged in one as well. Murphy was nominated in an energetic speech delivered by Gov. Dannel P. Malloy, of Stamford. "This is the kind of fighter we need ... I know when Chris is in the Senate, when the Republicans propose cutting taxes for the wealthy, Chris will be leading the fight against that proposal," Malloy said. "I know when Republicans in Washington make their frontal assault on Social Security, Medicaid, Medicare, Chris will be leading the fight against them. I know when Republicans want to take us back in the direction of the terrible, terrible Bush leadership on the economy, Chris will be leading the fight to make sure we won't go back to Bushland ever again." Bysiewicz, pointing to a vote Murphy cast in 2010, has attempted to portray the congressman as beholden to special interests on Wall Street, not the middle class. But carrying a sign for Murphy on the convention floor was Matt O'Connor, political director with the Service Employees Union International. "He has a record that includes more than a single vote," O'Connor said. "When the workers have needed him, he's been there." State Sen. Gayle Slossberg, D-Milford, worked with Murphy when he was a legislator and also with Bysiewicz. But Slossberg Saturday was encouraging delegates to back the former. "I've been in the trenches with Chris Murphy on policy issues for a long time," Slossberg said. "I know what he can get done in Washington." Another Murphy supporter -- former Norwalk Mayor Alex Knopp -- said that city's vote for the candidate was a good example of how Murphy has managed to win over areas of the state who are less familiar with him. "Don't forget Susan's been a statewide officer for years and made many trips to Norwalk," Knopp said after it was announced 27 of the city's delegates backed Murphy versus 13 for Bysiewicz. A few minutes later a couple of delegates switched, bringing Murphy's Norwalk total to 30. Of the two minor candidates seeking the nomination -- Matthew Oakes, of East Hartford, and Lee Whitnum, of Greenwich -- only Oakes attended the convention. He earned one delegate's vote. Oakes has begun collecting signatures to petition his way onto the August primary ballot. But he said he might end up endorsing Murphy over Bysiewicz. "Chris and I have hit it off very well," Oakes said. "I think he's more in line with the people I've been talking to."